A few months ago in our Blog, we wrote how Agiliway develops TYPO3 competency. We would like to follow up the progress the company made in this direction for the past months and address your attention to some feedbacks from our TYPO3 specialist Roman S. In this article Roman tells us about the way he learned the technology, shares the valuable information about the challenges and difficulties he faced, highlights the advantages and disadvantages of TYPO3 compared to other platforms he has worked with before and gives useful advice and resources for those who wants to start learning TYPO3 CMS. R.S: – It was something new and challenging. The first time I met TYPO3 in 2013. I’ve had good experience with different PHP CMS AND frameworks before, like WP, Joomla, Zend, Laravel, and YII, and decided to learn something new. That first TYPO3 project was a small website where some changes to the functional part were required. At that time, it seemed more complicated to me comparing to other CMS. But during the process I have realized that this is something completely different and it offers great opportunities. With the help of literature and advice from company experts, I managed to complete my first task for TYPO3 development and gained initial work experience. I discovered a lot of new things while working with TYPO3 CMS. What captured the major of my attention was TypoScript which is used to configure and display the website. In 2015 I was assigned to the project from an Austrian customer insisting on the use of TYPO3 as their proven platform. It was a huge project with a lot of data and users with different access types (which is convenient to accomplish with TYPO3). This project provided me the opportunity to try most of the features of this CRM. The basis of the project was formed with the help of the team and then development began. Within the development process, I gained the experience of enterprise project development with TYPO3. So that I’ve realized that TYPO3 is the best system for completing tasks of the kind. Q: Was it easy to learn TYPO3? R.S. : – The process was rather engrossing and novel for me. 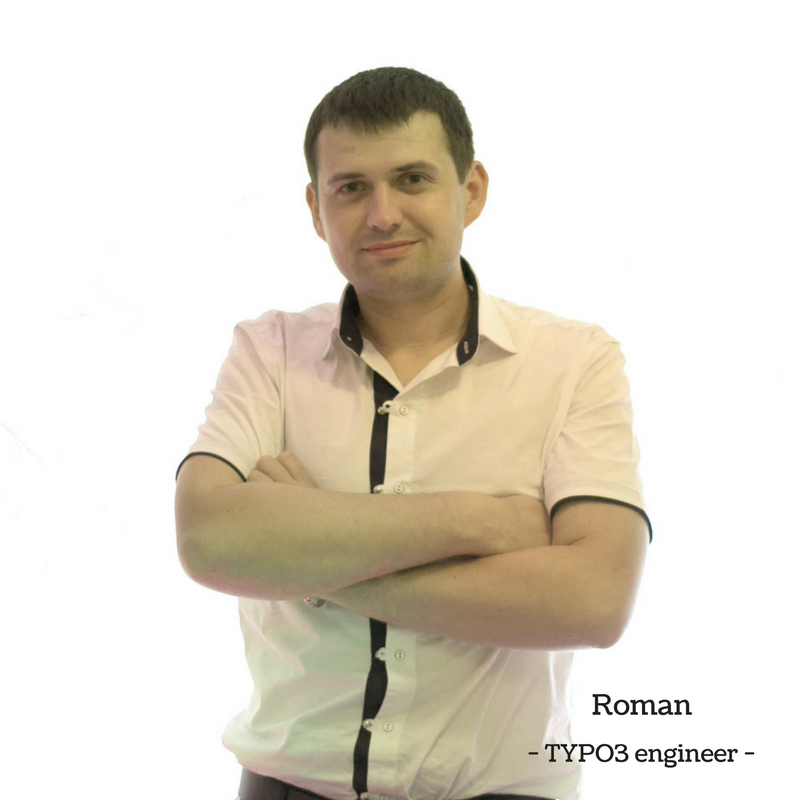 For me personally, the process of learning TYPO3 was new and exciting experience. Perhaps, recommendations and interesting stories about the system turned into the main impetus for me to begin the TYPO3 learning. Over time, I realized that TYPO3 is a really cool system and, to be frank, it is far from being easy to comprehend. Q: What was the most difficult or complex thing? R.S: – The most difficult is to set up and build a project basis correctly. At that stage, you need to pay more attention to TypoScript and take into account the requirements of the specification. During the process other challenges have appeared, like a construction of the project as a whole, and the extensions themselves. To resolve difficult situations, I read books and articles in communities that guided me in the right direction. Q: How long does it take to become confident TYPO3 developer? 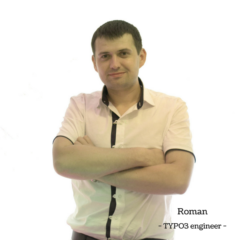 R. S.: – How much time one needs to learn TYPO3 – it depends. It means that for each person the time, necessary to learn TYPO3 differs. Every software engineer starts the studying process with his own experience background, which allows to learn the system either faster or slower. It also depends on how quickly an engineer can learn something new. It took me about 1.5 month to feel myself more or less confident about writing TYPO3 code. This period includes the time to become prepared to participate in substantive work in a team and to work along with specialists already having extensive experience in TYPO3. Q: Now, comparing TYPO3 to other CMS platforms you worked with, what are the benefits of this technology? – …. and disadvantages? R.S. : – Each platform serves for different needs best, you shouldn’t compare. Yes, I read a lot of articles which tried to compare TYPO3 with other CMS systems. I would rather don’t do this, because different systems serve different purposes. For example, Drupal is widely used for large projects, with interactive user involvement and for the purpose of organizing large amount of data. Joomla is used for information portals, where the main t part of user activity is focused around articles, WordPress – is used for creating blogs, Magento – for e-commerce projects, and so on … TYPO3 can be used both for small and large sites. You should always understand the best alternative for a particular concept. For instance, you’d better do not opt for TYPO3 to build an online shop, since there are other CMSs which serve this purpose better. Q: Good, what would you suggest to people who’s just starting with TYPO3? R.S. – Well, you may don’t feel confident at the beginning, and it’s ok.
Do not worry if, initially, you will face some difficulties in learning. Explore more literature about TYPO3. And make sure to analyze the existing examples. And definitely, I’d like to express my appreciation to TYPO3 specialists from Agiliway company for the support during the process of obtaining TYPO3 expertise. Q.: Thank you, Roman, for the interesting story. And good luck with improving your TYPO3 skills.